Following in the footsteps of other strong players, Grandmaster Viktor Korchnoi went through Botvinnik’s Soviet Chess School and rose to be ranked among the world’s elite for close to 50 years throughout his life. He played in two different World Championship matches and has defeated a record nine(!) different World Champions in his career. Known for his strong counterattacking style, Korchnoi continues to be a very tough opponent, even now when he is more than 80 years old! Viktor Korchnoi learned to play chess at the age of 5 but didn’t start playing seriously until a few years later. In 1943, he began to receive his first training from different strong local players and won the USSR Junior Championship in 1947 and 1948. After a series of high placings in strong tournaments he was awarded the International Master title in 1954 and later became a Grandmaster in 1956. Korchnoi was another player who followed in the footsteps of other strong players by going through Botvinnik’s Soviet Chess School, facing off against stars including Mikhail Tal, Tigran Petrosian and Boris Spassky. His playing style was one based on counterattacking. He would let his opponents start an attack then come out of nowhere with a strong rebuttal. Later in his life he twice played for the World Championship title against Anatoly Karpov in back-to-back challenges in 1978 and 1981, losing both matches. Along with Paul Keres, they have both defeated nine (!) different World Champions in their lifetime. 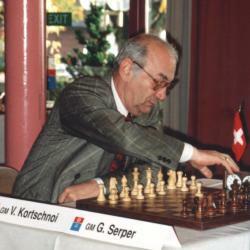 In 2006, Korchnoi won the World Senior Championship. Korchnoi continues to be a strong opponent even now, despite being older than 80 years.